Our family loves Asian cuisine, but what I really enjoy is having someone else make it for me. Unfortunately, that doesn’t fit in the family budget, so slowly, I am trying to incorporate more meals with an ethnic flair. I think my favorite foods to order out are the Honey or Sesame Chicken, yes, both friend, but I really want to add the flair without all the fat. 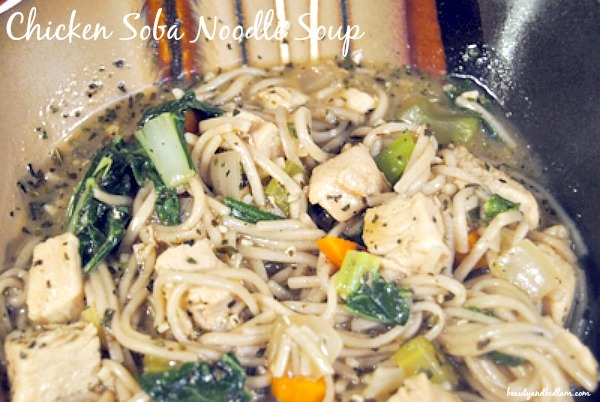 This Skinny Chicken Soba Noodles Soup started out as another attempt to broaden our culinary palettes while staying within my Whole Foods/17 Day Diet menu, but turned into an adventure in shopping. Part of the problem with attempting to recreate a dish as authentically as possible when you aren’t used to new and diverse ingredients is that some of those ingredients might be tricky to find or you may not even know specifically what they are. For your little culinary lesson of the day, Bok Choy is Chinese cabbage and Soba noodles are thin Japanese noodles made from buckwheat flour. They are very delicious, but they may not be in every grocery store, so check any Asian Grocery Stores or one of my favorite home decor stores, World Market, stocks them. Honestly, feel free to substitute any thin noodles for the Soba Noodles. It will have a slightly different twist, but the flavor base will be the same. Some of our other family favorites with an Asian Twist: Low Fat Simple Sesame Chicken, Low Fat ,Orange Chicken Recipe , Sesame Chicken Tenders , and Easy Homemade Teriyaki Sauce. Thanks to my friend, Jeff, for sharing this recipe. Cut raw chicken into cubes and set aside. Cook cubed chicken in nonstick skillet over medium heat in 2 tablespoons sesame oil until no longer pink. Meanwhile, heat the remaining 2 tablespoons of sesame oil in the Dutch oven over medium heat. Add carrot, celery, and onion. Cook 5 minutes, or until tender, stirring frequently. Add 1/4 teaspoon of salt, ginger, and garlic, and cook for another minute, stirring constantly. Add another 1/4 teaspoon salt, water, soy sauce, chile sauce, broth, and chicken. Bring to a boil, then reduce heat and simmer for 15 minutes. Increase heat back to a boil, then add soba noodles. Cook for five minutes. Stir in bok choy, reduce heat, and simmer for three minutes. I always taste test here to see if it needs more spices or a little extra kick of heat (as in red pepper flakes). Stir in 1/4 teaspoon salt, green onions, basil, and pepper. Cook two more minutes.